This book is probably the best introduction to and overview of the postmillennial position. Reading this book would help to correct the endless caricatures and strawmen of postmillennialism that one comes across all too frequently. Moreover, the author also allows for a great falling away immediately prior to Christ's return. Thus, he corrects some of the excesses of other modern postmillennialists while doing justice to all that the Bible teaches on the subject of the expansion of the gospel in history and conditions on the earth shortly before the Lord's return. I read it because Hulse called it the best modern defense of the Puritan view of eschatology. Whether it was the best, I am not qualified to say. But it certainly was good.Two key insights I gathered from Davis:1. Partial-preterism regarding the book of Revelation is not a necessary condition for Postmillennial Eschatology. Davis believes, as do most theologians, that revelation was written around 100 AD. 2. Eschatology is Christology. This is, as near as I can make it out, Davis's thesis—it is certainly his refrain. And he argues it well. If Eschatology is Christology and if Christ is Lord of heaven and earth right now, then we get something fairly closely (at least in flavor) to Postmillennialism, don't we?There is a chapter on the historical spread of the Gospel. Insofar as this sort of thing encourages the saints and rebuts the illiterate claim that "things have always been getting worse," it is helpful. 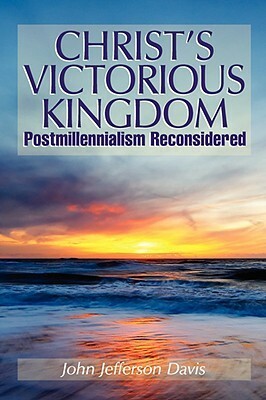 But as a positive argument for Postmillennialism it carries little weight. All the same, it is nice to know. This is an excellent read. I don't hold to Davis' flavor of Post-mill but I agree with the big picture. A great defence from both the Old and New Testament. Excelente. Publicado pela Editora Monergismo. Good introduction. There are stronger arguments for post-mil, but this is a good primer.